Successfully Added Digital Microscope and Case for iPhone 4 / 4S - 100X Magnification, Manual Zoom and Focus to your Shopping Cart. 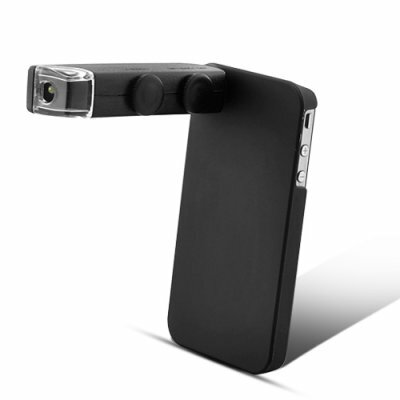 Turn your iPhone 4 and iPhone 4S into a portable microscope with this Premium Digital Microscope and Case, the first zoomable microscope/lens for your iPhone. The Premium Digital Microscope for your iPhone 4/4S is a reliable mini device that gives you access to the micro universe and its inhabitants. Have you ever wondered what is jumping on the surface of your skin or what kind of little stuff is sharing your mattress? This fun gadget, with a magnification rate of up to 100x, will surprise you by revealing all what you have never suspected to be so close to you! What's more, this Premium Digital Microscope features a super-bright white LED for added illumination so you can be sure you won't miss out on any of the details. There's even a manual zoom function and focus dial for you to adjust and fidget away until what you're seeing is crystal clear. Add on to that your iPhone 4/4S' super clear camera and you can even take picture snapshots of your discoveries! Check out how much we sell this great iPhone 4 Premium Digital Microscope for and order it right now for yourself or to make profit by reselling it on your web store before we run out of stock! Once again it is brought to you by your best source of amazing electronics, Chinavasion.